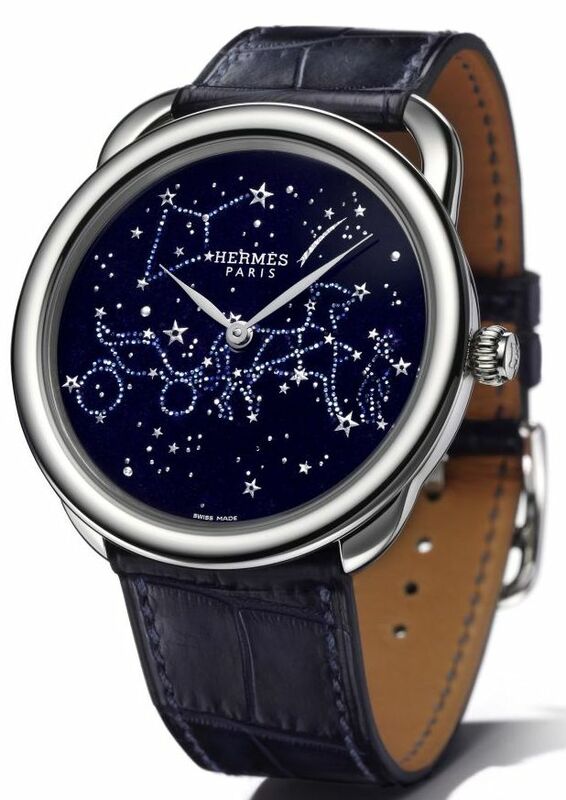 Swiss watch brand Hermès enriches its Arceau wrist watch collection with a new celestially inspired model studded with star-like paillons or spangles.In a twilight sky spangled with stars, the emblematic “Duc Attelé” Hermès emblem stands out discreetly. With perspective created by the age-old technique of grand feu paillonné enamelling, the dial of the Arceau Attelage Céleste watch pays a moving tribute to the artistry perpetuated in the Hermès workshops, where the human hand brings matter to life. Only a few craftsmen have achieved mastery of the complex and demanding paillonné enamel technique. First meticulously hand-engraved on the gold dial, the pattern reproducing a detail of a Hermès trinket dish is then covered with translucent blue pigments and repeatedly fired in a kiln at nearly 800°C. Star-shaped gold paillons, delicately placed one by one during the enamelling, spangle the sky. The enamel artist herself made the gold confetti stars that intensify the depth of field on the dial. Behind the astral face lies the H1928 movement exclusively crafted by Vaucher Manufacture Fleurier, and its solid gold oscillating weight adorned with a sprinkling of H symbols, visible through the sapphire crystal case-back. Extending the round white gold case radiating an air of imperturbable elegance, the asymmetrical lugs bridle an indigo alligator cord-strap subtly echoing Hermès’ cherished equestrian universe.